One of the interesting things about the beef chuck eye, a cut of meat taken from the moderately tough chuck roll subprimal, is that it contains a few inches of the very tender longissimus dorsi muscle, which is what ribeye steaks are made from. When a beef carcass is being fabricated, the chuck primal and rib primal are separated between the 5th and 6th ribs. You can take a whole beef ribeye and line it up with the chuck eye. They're a single, continuous piece of meat that just happens to have been divided (arbitrarily) at that particular spot. Even though beef chuck isn't generally known for its tenderness, the chuck eye offers about three inches of what is essentially ribeye steak. In a chuck eye, the ribeye muscle is surrounded by fat and connective tissue, as well as other muscles (the spinalis dorsi, complexus, and multifidus dorsi) that are less tender. Some butchers (or chefs) will trim away all that surrounding meat, leaving only the ribeye muscle. In this case, you're getting a steak that is pretty much exactly the same as a ribeye but for quite a bit less money. Indeed, you'll occasionally hear chuck eye referred to as a "poor man's ribeye." The downside for the butcher is all the material that's trimmed away has to go into the grinder, which to them is like stuffing money into the grinder. Instead, what usually happens is they'll simply slice straight across the first few inches of chuck eye, and then use butcher's twine to hold the resulting "steaks," consisting of the ribeye muscle along with all that surrounding material, together. It's not clear which is the greater indignity; that piece of string or the fact that chuck eye steaks are all-too-frequently marketed as "Delmonico" steaks. This might not qualify as a "deplorable" practice. It's more like "laughable," because whatever these steaks are, they're definitely not Delmonicos. Admittedly, no one really knows exactly what a Delmonico steak is, but one thing it absolutely isn't is something that needs to be held together with a piece of string. Chuck eye steak is a much more accurate description. 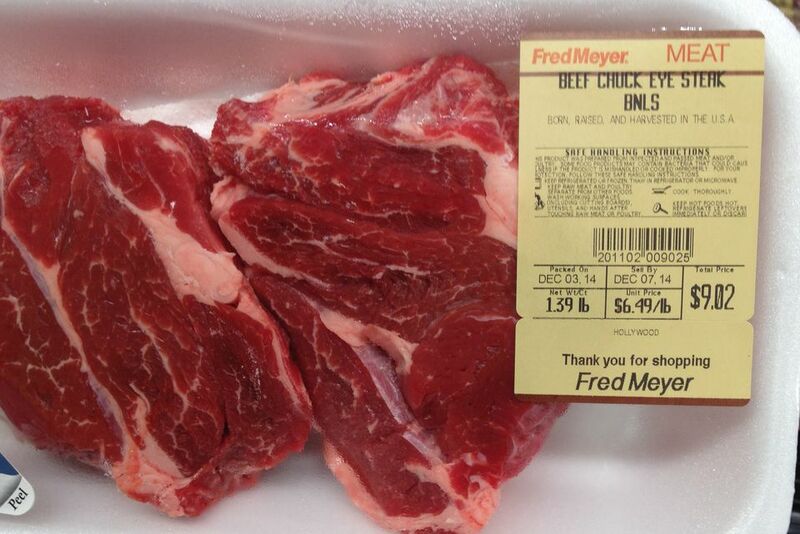 When you see chuck eye steaks at the store, you won't necessarily know whether they were actually the first three inches of the chuck eye, which you could just barely cook on the grill, or maybe an inch or two further up toward the neck, which would definitely need to be braised.